Attosecond (1 as = 10-18 s) science represents one of the frontiers in Ultrafast Optics since it offers the possibility to influence, control and monitor the motion of electronic waves. After a decade from the first experimental demonstration of the generation of attosecond pulses, the attosecond field has shown exciting experimental and theoretical developments. Novel experimental methods have been introduced for the measurement and application of attosecond pulses. Attosecond science is now a well developed research area. In a number of important physical and chemical processes the relevant temporal scale is set by electronic motion instead of nuclear motion: this is the case when charge transfer, i.e. the motion of an electron or a hole along a molecule or between two molecules, is the crucial step in the process. Biophysics offers fundamental examples where charge transfer plays an essential role, such as photosynthesis and various chemical reactions in large peptides and proteins. Theoretical studies have pointed out that very efficient charge transfer can be driven by purely electronic effects, which precede any rearrangement of the nuclear skeleton and which can evolve on a temporal scale ranging from few femtoseconds down to tens of attoseconds. 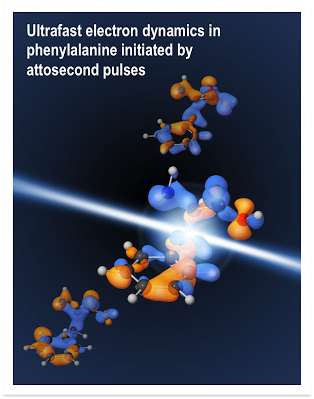 We have observed the pure electron dynamics occurring in the amino acid phenylalanine after sudden ionization by XUV attosecond pulses. This ultrafast dynamics occurs on a sub-4.5 fs temporal scale, which is shorter than the vibrational response of the molecule. Attosecond pulses are produced by using the process of high-order harmonic generation (HHG) in noble gases exposed to intense (peak intensity I~1013-1015W/cm2) femtosecond light pulses. As a result of the physical processes at the basis of harmonic generation, bursts of extreme ultraviolet (XUV) pulses are emitted with sub-femtosecond duration every half optical cycle of the fundamental radiation. The generation and the applications of isolated attosecond pulses present peculiar characteristics. From the point of view of laser technology, the confinement of the XUV generation process to a single event requires the use of femtosecond driving pulses with controlled electric field. Since the first demonstration of the generation of isolated sub-femtosecond pulses, various techniques have been proposed and partly implemented for the production of such pulses. In our attosecond laboratories we employ two temporal gating schemes: the polarization gating and the ionization gating, both based on the use of few-optical-cycle driving pulses. Pulses with duration <150 as are generated with energy in the nanojoule range. In the last few years we have demonstrated various applications of isolated attosecond pulses in the investigation of ultrafast electron dynamics in atoms and molecules, in collaboration with various international research groups active in the attosecond field.